One of the new online slots titles made for slot developer Microgaming’s Quickfire platform that seeks to host games that can work seamlessly across online sites and mobile devices, Arabian Rose is a typically slick piece of slots fare. 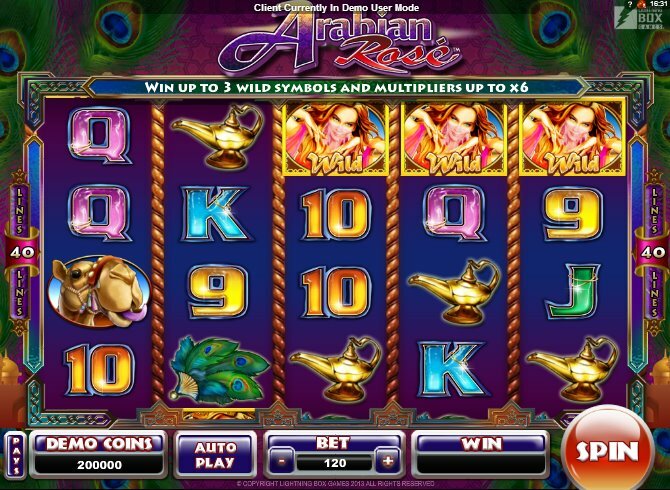 Created by Aussie software design firm, Lightning Box Games, for the world-beating supplier, Arabian Rose is another Aladdin-themed slot (it’s hard to say there’s a lack of those around right now) with plenty of Arabesque icons and a hint of the Arabian Nights about it. You will feel the mood of this slot from the very second you press the play button and you will love it if you adore the Aladdin story. Played out over 5 reels and featuring 40 pay-lines, but four rows for more chances to hit, the game has icons you’ll probably recognize if you’ve played Sheriff Gaming’s state-of-the-art 3D slot, Alawin, or Aladdin’s Wishes from RTG: magic lamps, camels that lick the screen when forming winning combos, Peacock feathers, evil wizards, palm leaves, buxom belly dancers and 10-through-Ace symbols. 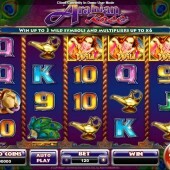 The belly dancing girl is Wild and appears on all reels and when she does appear in a winning combo she multiplies winnings by 2. She will also expand on the middle three reels. She substitutes for all symbols than the Scattered rose, which triggers a free spins round if you hit three or more on the reels. First you’ll get to pick from various coins to determine the number of spins and the value of your multiplier; anything from 7 to 14 free spins can be yours, with multipliers up to 8x up for grabs. You will also get a chance to bag some extra Wild symbols for the duration of your spins. In terms of some good features, Arabian Rose really delivers – the theme is well-explored, if a little done to death, and if you hit the bonus round a few times in relative succession, some nice wins can be yours. It doesn’t push Sheriff or RTG’s aforementioned Aladdin-themed slots in the way of graphics and animation but it certainly delivers in typical slick Microgaming fashion.